Here are some frequently asked questions when there are problems in the process of injection molding, here some of the most popular ones and their solutions. What happens when the molds are brittle and delaminate? The cause may be an improper injection screw. The screw that is used for molding at a low-pressure ratio fro the amount of resin being used; causes the plastic’s molecules to form incorrectly. Basically, a weak molecular structure can cause brittle parts. When this happens de lamination can occur as well. The result will be a to take a pressure reading and record the ratio. This should be performed once every six months. Another problem may be discoloration; the possible cause for this may be excessive dwell time or what they call residence time. When a part has been discolored or changed the problem is usually found in the residence time. The material stays in the barrel too long, the base will become discolored. What can be done is the heat sensitive materials have to be set at a certain ration. After every injection shot clean out the barrel. Discoloration may also be caused by an improper plastic mold temp. The hotter the mold is it will keep the material melted for a longer period of time. 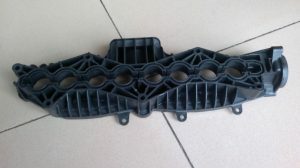 The temp of the mold should be adjusted to the supplier’s specs on material and cycle times.